Lightning Motorcycles with their new sponsor Barracuda Networks. The bikes were charged via this solar panel. Steve Atlas' Icon Brammo motorcycle took second. Muench Racing brought their TTE from Germany. 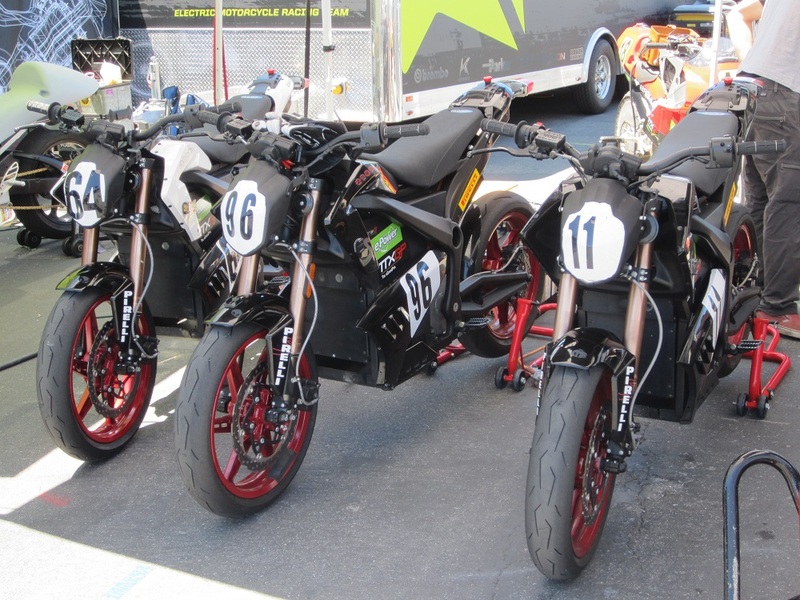 The Virginia Tech Honda CBRE Zero motorcycles, which are almost stock. 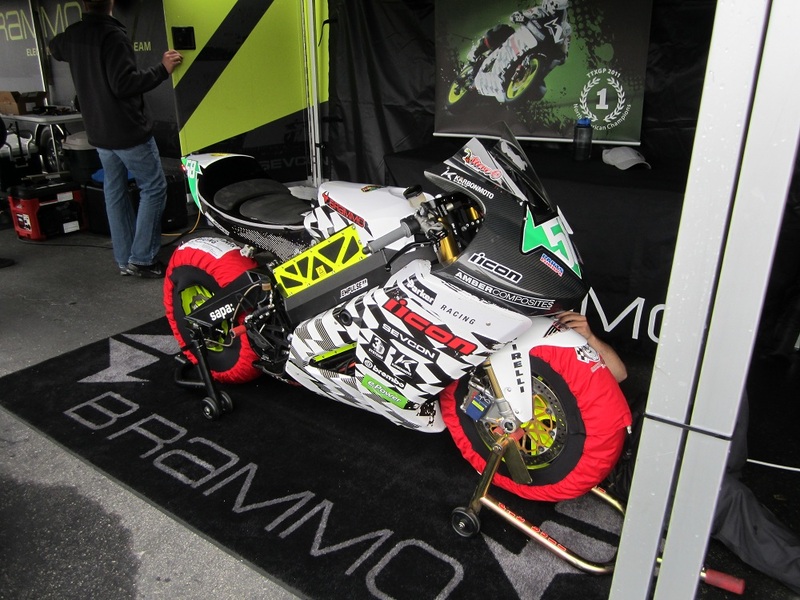 Brammo added a second bike to the team and signed Eric Bostrom to ride it. Steve Atlas, Michael Barnes, and Eric Bostrom. Fog may have delayed the race by a few hours but it didn't put a dampener on the mood along the pitwall at this seasons only TTXGP North American joint round with FIM epower. The weekend delivered a thrilling race at arguably one of the most technical and mythical courses on the planet. 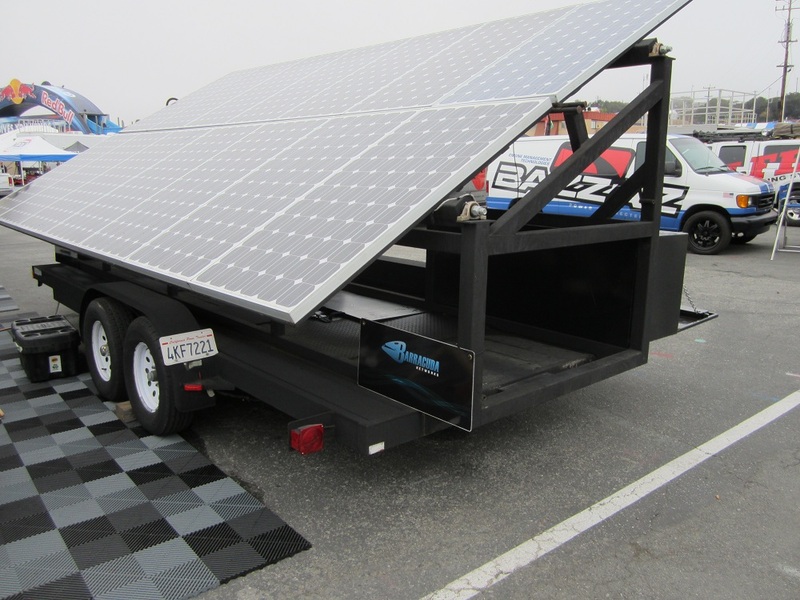 Michael Barnes on the Barracudea Lightning Machine; fully charged with electricty generated by the solar panels thanks to the new sponsor Barracuda Networks, had a fantastic start storming into the lead from the get go. He was clearly a man on a mission, out to wipe out the memory of the previous two outtings at the track where he had been pipped at the post by rival Michael Czsyz. The plan worked and he delivered an incredible performace banishing the consistency issues faced by the team in the opening round of the season. Taken from the post race press conference... Interviews with winning TTX75 rider Robert Hancock and eSuperstock winner Kenyon Kluge will follow shortly. Compared to last year the race speeds closer to the practice times? 1000 as far as the torque is concerned....the sky's the limit with electric power, we will eclipse something soon. I don't when or how but we are going to make our mark with the electric industry that’s for sure. What’s the next step racing wise? Compared to qualifying times you were putting some really fast times in the actual race? “Yeah, I only got to one lap in qualifying due to 15c resistor part in the bike not working. And I only did 3 laps in the first practice so the race was all new for me as I didn't get much track time before hand. for first few laps, I stuck behind Eric as though he is on the same bike I am on so I should be able to do what he can do but unfortunately he had some trouble and I just feel in the groove and I was surprised by how quick we were going but my team Icon Brammo did a great job and worked really hard to prep two bikes for this weekend with the bike a huge improvement over last year. Probably 7 or 8 seconds faster than last year. It was fun out there trying to keep Barney in sight. It was cool to not have a huge runaway as there was in the past and it is really cool to have a new team mate in Eric and i am excited for the rest of the year. Once the battery technology catches up we will give the gas bikes a run for their money. You’ve ridden many bikes, in many different classes, and here you are in an epower race. It's an interesting concept. What do you have to say about it? “I only rode the bike a week ago and I said to the team if I don't like it I am out. But just pulling out of the pits and coming out of the race track, it put a big smile on my face and surpassed all my expectations; I am still coming up to speed on how to ride the bike and it may have caught me out a little bit. With Barney setting a blistering pace it was cool to see the other Brammo up there and my team mate Steve pushing me to go faster. The biggest disappointment for me was not being able to keep Barney honest and push him to the end." "The feel is the similar to a normal motorcycle. We have teething problems with a new motorcycle that’s all it is. I am sure if asked somebody like Kenny Roberts then he would say the same thing about a gas bike that is at this stage of development." Do you miss the noise? It must be very strange for you to ride without the noise? It is strange, but you feel like more than ever that you are in your own little world, the sensation of not having engine rpm to gage what you should be doing so there is a feeling of 'oh man they have taken away some of sensations' but on the flip slide you have more sensation and more feedback from the asphalt so you are getting better feedback to i can actually hear and feel the rotors on the bike. AMA favorite and star rider Eric Bostrom (Team Icon Brammo) divides team Barracuda Lightning riders Michael Barnes and Tom Montano on the challenging Californian Mazda Raceway Laguna Seca circuit. Matthias Himmelmann was the first rider to set a time under 1.40 mark, quickly followed by Michael Barnes who set his fastest time on the third lap out. Tom Montano and Eric Bostrom joined them and set the tone for the qualifying session. 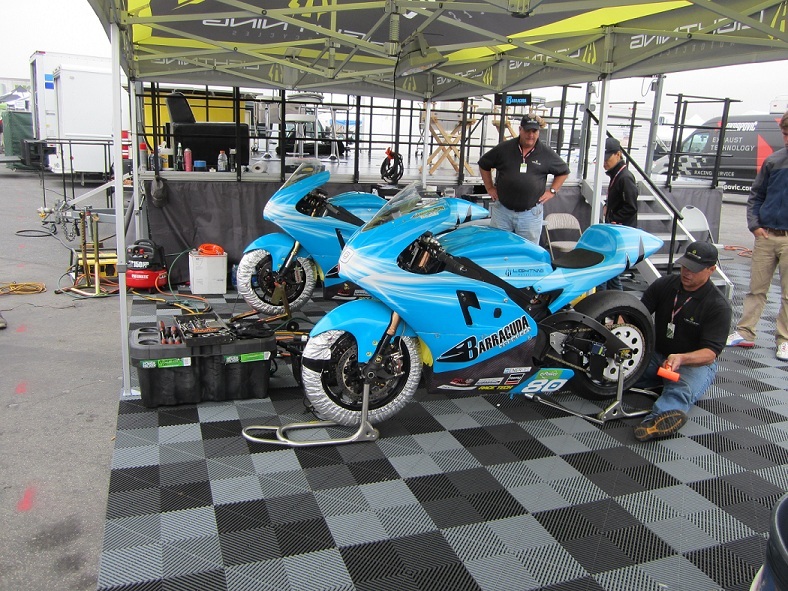 Jeremiah Johnson (BE.EV.com) having experienced technical issues on his machine was fortunate to be offered a Zero S motorcycle for the qualifying session. Tomorrow the e-Power/TTX race (9 laps) will start at 10.25am. The third round of this years championship is a joint round with FIM ePower held at the world famous Mazda Raceway Laguna Seca during the US Grand Prix. Today saw the first practice of the weekend with newcomers to the grid Tom Montano (no. 89 for Barracuda Lightning) and Eric Bostrom (no. 32 racing for Team Icon Brammo), the weekend racing should be exciting. It has been a spectacular day with high and lows for the teams. After the rain during round two at PIR the Californian sunshine was a welcome change for the TTXGP North American racers joined on the grid this race by their European cousins from FIM ePower, no. 49 Matthias Himmelman and 65 Katje Poensgen. 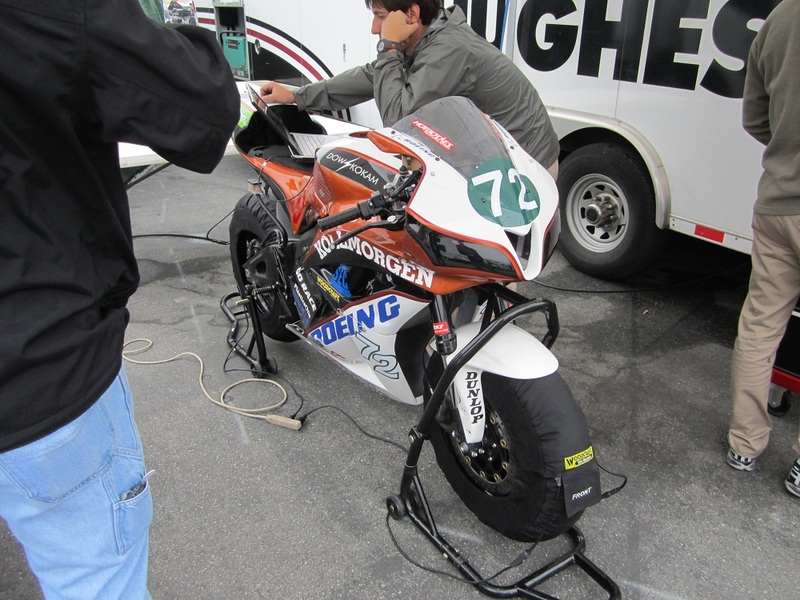 With 11 riders entered for this year’s event, Kenyon Kluge (Zero/K Squared Racing) and Ted Rich opened with their production based motorcycles. The best time (1’35.024) was set by Michael Barnes (Barracuda/Lightning) with a top speed of 219,7km/h. 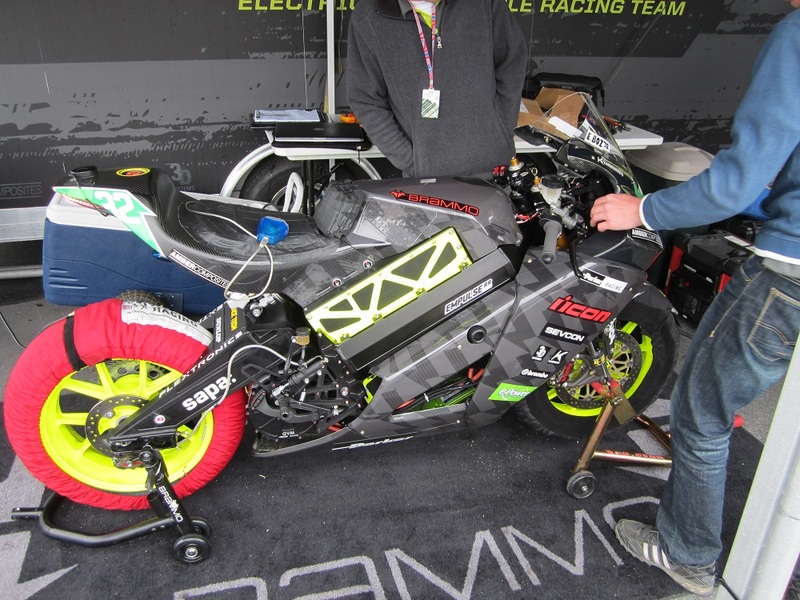 Second fastest was Steve Atlas (Team Icon Brammo) followed by Tom Montano on the second Lightning. Following the practice session the team solved the simple technical glitch and is now confident for tomorrow qualifying session. Qualifying practice is scheduled tomorrow Saturday at 17:10 (30mn). 7/26/2012 Team Icon Brammo to add Eric Bostrom to roster. Read presss release HERE. 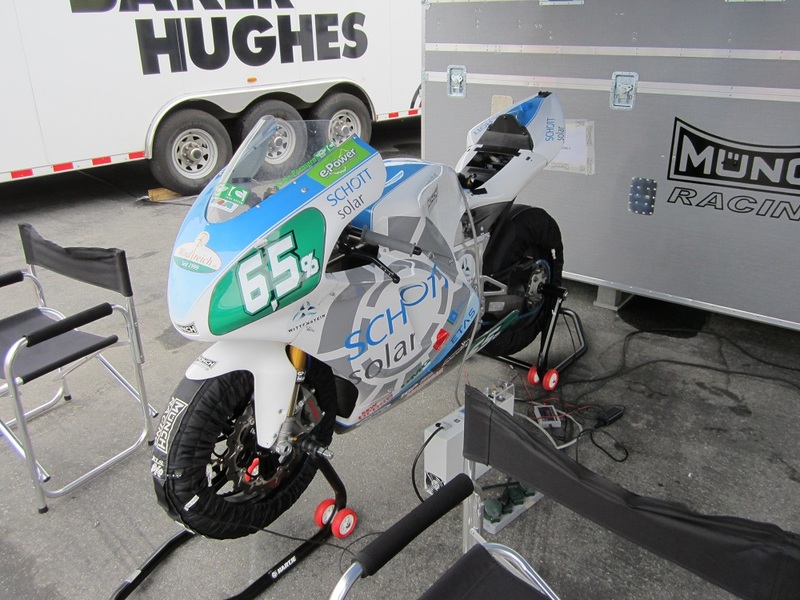 7/26/2012 Muench Racing Team to enter two motorcycles in the 2012 FIM e-Power/TTXGP race at Laguna Seca.